After taking a scenic drive along the coastal road of the Saronic Gulf, you will come to the ancient city of Mycenae home to the kingdom of mythical Agamemnon. Visit the tomb of Agamemnon, the Palace and the Lionesses Gate. Stop off at the picturesque town of Nauplia before arriving in Epidaurus. The world heritage listed city is reputed to be the birthplace of Apollo's son Asklepios, the healer and was the most celebrated healing center of the classical world. 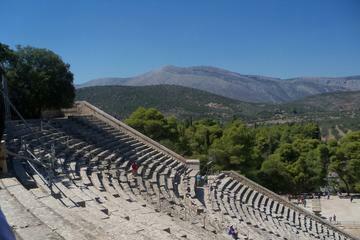 Epidaurus is probably most famous for its theatre, one of the best preserved classical Greek buildings and still used today due to its amazing acoustics.